On June 16, at the Baltic Shipyard have lowered the biggest and powerful nuclear power icebreaker "Arctic" of the project 22220 in the world. Have participated in a ceremony of descent: Chairman of the Federation Council of Federal Assembly of Russia, Valentina Matviyenko, plenipotentiary of the President of the Russian Federation in the Northwest federal district Vladimir Bulavin, Chairman of General Court of St. Petersburg Vyacheslav Makarov, vice governor of St. Petersburg Sergey Movchan, CEO of Rosatom State Corporation Sergey Kiriyenko, CEO of LLC Baltic Plant Shipbuilding Alexey Kadilov and other guests of honour. Valentina Matviyenko in the congratulation has noted that today Russia comes to a new stage in the development of the Arctic and the most modern and reliable equipment for this purpose is necessary. 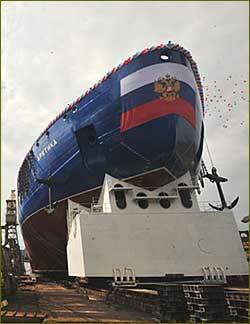 "Godmother" of the new icebreaker ship has wished it and team of the ship of good luck and "seven feet near Kiel". Congratulating on behalf of the Governor and the Government of St. Petersburg a management of Baltic Shipyard and all who worked on the creation of the ship, the vice governor Sergey Movchan has emphasized that the city will support further a shipbuilding industry, in particular – Baltic Shipyard. "Baltic Shipyard – a leader in the sphere of icebreaking shipbuilding of our country. I am sure that having realized this project, we open the new page in the development of the Arctic", – the vice governor has noted. The engineering design of the icebreaker ship has been developed by CDB Aysberg in 2009. The two-sedimentary design of the vessel allows to use it both in the Arctic waters, and in the mouths of the polar rivers. The icebreaker ship will work in the western region of the Arctic: in the Barents, Pechora and Karsky seas, and also on more shallow sites of the mouth of the Yenisei and the region of the Gulf of Ob. The icebreaker ship "Arctic" has the two-reactor power station with the main source of steam from reactor installation of new generation capacity of 175 MW which is specially developed for this vessel. City news archive for 17 June' 2016.